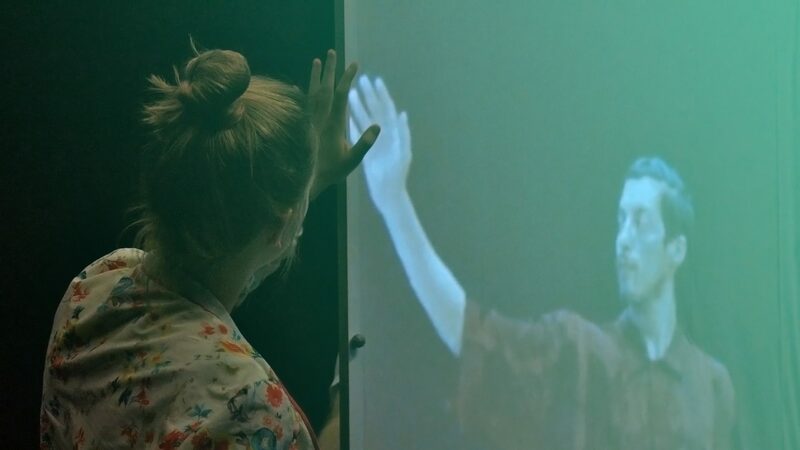 The short performance «Moving Screens, Sounds, and Bodies» is an excerpt from the research project «Telematic Performance Format». It is a prototype performance involving dance, music and state of the art technology. Four dancers and two musicians, located in two geographically distributed locations and mediated by networked audiovisual technologies, meet and interact in real time. Through an interplay of movement, sound and various telematic elements, they explore their unity over distance and their quest for proximity. This is a work about rhythm, intimacy, the sense of presence and the impossibility of both touch and simultaneity. «Telematic Performance Format» explores the artistic potential of videoconferencing systems and telematic performances. It activates both human and technological agents in complex, multi-layered interplays: performers tracked, spaces layered, projection screens are set in motion, these transmogrify into windows with views into distant room; all of which enables a presence of virtual bodies. The technical means here – high-quality, low latency, bidirectional video and audio streaming, movement tracking, video mapping – are not merely deficient transmission media, but active players that connect and coordinate systems within real and virtual spaces. Let’s play. Some impressions from our experiments in the research project “Network Performance Format” at the University of Arts Zurich. The project explored the specific qualities and defined principles and logics for a dislocated performance format. In this format the peformance is happening at the same time in different locations interconnected through network technologies. These technological environment demands an own artistic practice dealing with specific phenomena (i.eg. delay). This conditions indicates that network performances can be defined as an own art discipline.